Scientists who decode the genetic history of humans by tracking how genes mutate have applied the same technique to one of the Western world's most ancient and celebrated texts to uncover the date it was first written. The text is Homer's "Iliad," and Homer -- if there was such a person -- probably wrote it in 762 B.C., give or take 50 years, the researchers found. The "Iliad" tells the story of the Trojan War -- if there was such a war -- with Greeks battling Trojans. The researchers accept the received orthodoxy that a war happened and someone named Homer wrote about it, said Mark Pagel, an evolutionary theorist at the University of Reading in England. His collaborators include Eric Altschuler, a geneticist at the University of Medicine and Dentistry of New Jersey, in Newark, and Andreea S. Calude, a linguist also at Reading and the Sante Fe Institute in New Mexico. They worked from the standard text of the epic poem. The date they came up with fits the time most scholars think the "Iliad" was compiled, so the paper, published in the journal Bioessays, won't have classicists in a snit. The study mostly affirms what they have been saying, that it was written around the eighth century B.C. That geneticists got into such a project should be no surprise, Pagel said. "Languages behave just extraordinarily like genes," Pagel said. "It is directly analogous. We tried to document the regularities in linguistic evolution and study Homer's vocabulary as a way of seeing if language evolves the way we think it does. If so, then we should be able to find a date for Homer." It is unlikely there ever was one individual man named Homer who wrote the "Iliad." Brian Rose, professor of classical studies and curator of the Mediterranean section at the University of Pennsylvania Museum, said it is clear the "Iliad" is a compilation of oral tradition going back to the 13th century B.C. "It's an amalgam of lots of stories that seemed focused on conflicts in one particular area of northwestern Turkey," Rose said. The story of the "Iliad" is well known, full of characters like Helen of Troy, Achilles, Paris, Agamemnon and a slew of gods and goddesses behaving badly. It recounts how a gigantic fleet of Greek ships sailed across the "wine dark sea" to besiege Troy and regain a stolen wife. Its sequel is the "Odyssey." Classicists and archeologists are fairly certain Troy existed and generally know where it is. In the 19th century, the German archeologist Heinrich Schliemann and the Englishman Frank Calvert excavated what is known as the Citadel of Troy and found evidence of a military conflict in the 12th century B.C., including arrows and 5 feet of burned debris around a buried fortress. Whether it was a war between Troy and a foreign element, or a civil war is unknown, Rose said. 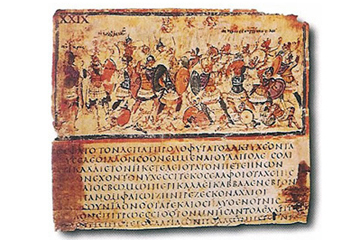 The compilation we know as the "Iliad" was written centuries later, the date Pagel is proposing. The scientists tracked the words in the "Iliad" the way they would track genes in a genome. The researchers employed a linguistic tool called the Swadesh word list, put together in the 1940s and 1950s by American linguist Morris Swadesh. The list contains approximately 200 concepts that have words apparently in every language and every culture, Pagel said. These are usually words for body parts, colors, necessary relationships like "father" and "mother." They looked for Swadesh words in the "Iliad" and found 173 of them. Then, they measured how they changed. "I'm an evolutionary theorist," Pagel said. "I study language because it's such a remarkable culturally transmitted replicator. It replicates with a fidelity that's just astonishing." By documenting the regularity of the linguistic mutations, Pagel and the others have given a timeline to the story of Helen and the men who died for her -- genetics meets the classics.